Atlas is first mentioned by Homer who also identifies him with the Atlantic Ocean. Based on Mt Atlas in Morocco and Homer's Atlantic ocean relation, it's not hard to see how Atlas became recognized as the first "twin king" of Atlantis after Evanor. The common knowledge relates Atlas with Shu, simply based on the reasoning of "enduring" suggested by the risen arms of Shu and the analogy that Atlas holds up the sky as Mount Atlas in Morocco relates to as well. So one would imagine that Solon was looking at the Egyptian hieroglyph of Shu behind his reasoning for translating Shu into Atlas. In truth, one would not be able to find a king who "endures" for what is it that he is "enduring"? The Egyptian God Min also means to endure such as the pyramid of Mennefer or the city of Memphis can mean "enduring beauty". Thus, Pharaoh Menes can also be seen as an "enduring king" like the Atlantean king Mneseus can be portrayed as well in meaning an "enduring God, deity or ruler. What they endure is time itself, and this is the answer to how we can locate such a King and why their names are preserved for thousands of years like Mountains. To endure time itself is to be The Foremost, which makes it even easier in our researches to locate such a King "within our histories" of common knowledge. Atlas suggests not a Greek name but rather an Egyptian name that was preserved from a Libyan name much like the giant Libyan Antaeus who battled Hercules like Atlas as well. Hercules deceived Atlas into holding up the skies again just as Hercules had to hold Antaeus above the ground to defeat him. So not only does the evidence identify that Greece and Egypt were in fact Atlantean settlements since Athena and Neith were common to them both, but also that Shu and Geb originated in the Libyan lands and Shu of course, is related symbolicaly to Atlas, the Atlantean King aside of Min, Menes, Mneseus and of course our Foremost Creator God, Ja Mn who has endured in our recorded histories for at least 5000 years. The real meaning of the name of Atlas can be found not in "enduring" but rather in "Foremost", and since Atlas is regarded and preserved throughout the millenias as Foremost, it is with reasoning that he was also a ruler or king of an ancient people memorized by the Atlantean Libyans. Thus the Libyan, Greek or Egyptian for Atlas, becomes " Foremost ruler of the people". Although it may be difficult to find the greek term of "At" for foremost, this is derived from the Egyptian word for "front or foremost" as HAt or Haty-a for ruler that was drawn by the forepart of a resting lion (mAi) heiroglyph. Queen HAt-shepsut also means Queen or "foremost of noble woman" and also uses the lion glyph. Commonly, the Greeks translated the Egyptian word HAt with the prefix of At, as in Athribis, explaining the Greek relation of At for Foremost. Egyptian; many - HH (HeHe - kneeling God with risen arms and a feather on his head hieroglyph) = people. A resting lion in front of the risen arms God would then mean HAt-HH or "Foremost of many" that would also compare as a hieroglyph seen by Solon aside of Shu for Atlas. Therefore, Atlanteans would mean our "Foremost Earthland people" or ancestors while Atlantis would be our "Foremost EarthLands", meaning our Origins as memorized by the Libyans and Egyptians in the realms of Nun, Seker's Amenti, The Trident symbol or The Atlantic Ocean. With the above in mind, your Lux of Ipse can better understand these two pictures, the latter being of an Atlantean voyage recorded by Pharaoh Menes ca.3200.bC. To summarize, this label speaks of a voyage concerned with the Temple of Neith, the transport or ceremony of an Apis Bull, Goose symbols of Gebs lands, 3 ships could also portray a 3 day journey. The right bottom glyphs read "HAt-nT-Tj-rw" or Foremost location of Tjeru if we use the x as nt for local or city, or simply Foremost city of Neith known as Tjeru, an Atlantean Libyan name like Tehenu for Egyptian Libya. Interesting that we see a Trident symbol (Nun's realm,Atlantic? )also and what looks like an Island glyph with pillars at the extreme bottom left. I haven't fully and correctly deciphered this label. As you can see this picture relates very well with the above picture and thesis. The problem in today's planet, is that the term "Atlantic Cultures" is recognized as "academic" while the more correct term Atlantean is erroneously not. Atlantic is an Ocean, thus Atlantic cultures can be anything like microbes, cells, bacteria, etc, and does not really imply people that is more commonly identified by adding "ean" as a suffix common to people's existence, thus Atlantean's or Pacificeans or Indeans or the "ian" endings. After all, we do exist and anyone living on or around the Atlantic Ocean are in fact Atlanteans! A comparison between Menes and Atlas. Another realization that we are faced with is that the names for our Atlanteans are only Greek translations of the "meaning" of the names from the Egyptians who also translated them from the Atlanteans. In other words, Atlas is not the first kings real name. Since Atlas can also mean Foremost of the People and my Latin bostrephodon translation of the kings names reveal that Mneseus played a more dominant role which also relates to Mnoans or Min-oans, I decided to take a closer look at Pharaoh Menes. We should understand how Atlas can mean "to endure" from Greek for "Tlas" which was also translated from the Egyptian heiro-glyph of "risen arms" as symbolized in the titulars of Ptah, Geb or Shu and also in any name with KA like Seka or Menkaure. This risen arms heiro-glyph also goes back to pre-dynastic Egypt around 3500.bC or the Atlantean Double Falcon era as the Tehenu Libyan Palette reminds us. Hat-remet or at-laos would be "foremost father of the people". A = origin, foremost, first established, sired, fathered, beginning. khenti-amenti is also "foremost of the westerners". epanateilantos = Greek for "risen land"
Tatenen = Egyptian for foremost or primordial "risen land" or "God's Risen land" since Tatenen is also a God of Egypt. We can also compare this to Memphis in it's older name of Hiku-ptah or Heka-ptah which can also be identified with Tatenen and Risen land. The Heiro-glyph or a kneeling god with risen arms is H.H or Heh. The Heiro-glyph of risen arms is also pronounced as KA. We are aware that the Risen Arms glyph is not only considered to represent Shu, Geb or Ptah but also Atlas. So in a sense, Hiku or Heka can also mean Risen which ironically, Heka is the magic of Egypt. Memphis was where Pharaoh Menes established the first temple to the god Ptah on an island in the Nile Delta. Pharaoh Menes also was married to Neit-hotep and built the first temple of Neith in Sais, Egypt. 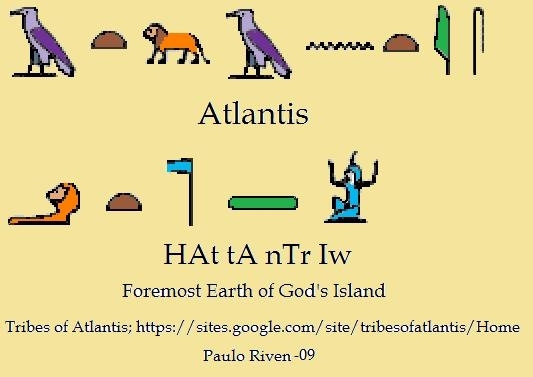 I have also suggested how Atlantis can be interpreted in Egyptian as Hat.nt.iw for "foremost island of Neith". Where iw in Egyptian means island like "is" at the end of AT-la-NT-IS can also be thought of as Isle or "iw". The name Atlan.t (is) can also be considered a feminine name as clarified by the letter .t at the end for female or women in Egyptian or Semitic languages. The relevance with NT or Neit is striking since we are also aware that not only is She mentioned in The Timaeus or Critias as being the same goddess worshipped by the Greeks as AThena, but also that She strongly represents Lower Egypt and is claimed to have originated in LIBYA, perhaps around the Atalantes regions of Lake Tritonis or somewhere near to Geb who also is associated with Libya. This comparison to Neith is also strengthened by the fact that Atlantis ruled Europe up to Tyrhennia (Italy) and Libya (north Africa) up to Egypt as mentioned by Plato. A strong fact that many ATlantis researchers ignore for their theories of Atlantis to be placed in far away locales like Indonesia, south or north Americas, Antarctica, Asia, the Black sea or even Greenland. The other striking fact is that Pharaoh Menes can also be compared to Atlas. The Glpyh for Mn = "enduring". Mn Nfr = "enduring beauty". Mn or Menes = "established"
Menes is also considered to be the "foremost or established father of Egypt" or the First pharaoh of the First Dynasty. I have also shown the mysterious bostrephodon (backwards) names of our Atlantean founders in the critias which reveal a Latin hidden message that also suggest that MneSeus and Evaemon were the main Atlanteans. Mneseus, I translated as "memory of a god or warrior" which also compares to his Egyptian title of Hor-Aha or "Horus The Fighter". He also introduced the worship of the God, Ptah. Eveamon was translated as "fortunate or favored woman" which can also be compared to Menes' wife, Neit-hotep. It is also interesting to note that Abtu/Abedju or Abydos was also the cult center of the god Khentiamenti (foremost of the westerners) who was later compared to Osiris. Abydos was the holiest city in Egypt during the 7th dynasty and had a canal from the river Nile up to the Temple of Seti I which was later usurped by Ramses II. Weneg-The flower-sign used to write his name "wng" was early on mistakenly replaced by a papyrus-plant glyph, changing his name to wadj-nes. This was translated into Greek by Manetho into "outgot-las", which resulted in "Tlas" in the transcriptions. This is saying that "nes" transfers to "las". So Mn-nes would also be At-las. At-las (laos/tlas) = foremost father (atte) enduring, (tlas) of the people (laos) = established, permanent. Mn-Nes = enduring (Mn) of the people (ns). (foremost established father) it=father in Egyptian. There are some interesting comparisons between the 10 kings of Atlantis and the First Dynastic kings of Egypt. There is of course, a question of whether the 10 Atlantean kings names are in order as related by Critias. Around 420.bC,Critias was able to study the original script passed down from 570.bC to rehearse for his presentation at the theater in front of Socrates which he orated from memory. This also leaves a question of whether Plato was using the original script from Dropides to Critias also or a recorded script of Critias' live speech at the amphitheater. Some of the Egyptian names like Menes, Djer and Merneith, seem to line up correctly while others do not. Gadeiros would be in Phoenician, GA DR, meaning rich in goats. Djer was also spelled in some cases DR, where we also realize that J and I were interchangeable. So Gadeiros or Gad (j) r can also be thought of as Djer. Queen Merneith lines up with Evaemon whose meaning suggests that it is a women's name. Considering 5 sets of twins were born to Cleito, it is highly probable that at least 1 of 10 would be a female child. Diaprepes, meaning "written knowledge of God", strongly suggests that He should be matched up to Semsem (semerkhet), whose name means "priest of priests" or head priest. His heiroglyph, 7th in the Abydos list, is the only glyph for a king drawn entirely as a standing priest with a was scepter. Den seems to suggest being lined up with Ampheres because he was known as the "two estates" and the first to use the "two ladies" nebty titular. His name by Manetho, Usaphais, also compares to Ampheres. Raneb, being identified with the Sun could compare to Azaes. These are the Atlantean and Egyptian names in order as recorded. extended some 19 miles along the west bank of the Nile. Queen Merenith ruled Egypt as regent when Den became king as a child. There are, however, many scholars who think that Merenith was a ruler in her own right. What this HYPOTHETICAL theory of Atlantis for Egypt, is that Atlas was Pharaoh Menes and Cleito was Neith. In relation to Menes' love of sailing and fishing, he may have given rise to Poseidon for the Mediterranean as in the term of Minoans and also disguised in Plato's list for the Atlantean King MNESEUS. I suspect this because of my own PLATO CODE for Atlantis and Plato's hidden message of the betrayal of Syracuse, Italy's King Dionysios with the East, who imprisoned Plato ca.360.bC when he wrote the Timaeus and the Critias dialogues. Not only does this reveal a traitor for the politics and secret message of his time, but it also reveals that, as I suspect, MNESEUS was the main King of Atlantean twins and not really Atlas who simply means "Foremost King" as Menes also is for our records of Egypt. Initially when I began my Atlantis research in 2003, at the onset I suspected that these 10 kings symbolized the Atlantean control for the entire Mediterranean and not what we are told in the Critias. This is reflected by my translations of the Twin Kings and Founders for their meanings, such as Mestor is Mesraim or Egypt. We know this to also be true because originaly, Neith and Athena are Atlantean Libyans (Africans). Ironicaly, Critias means "Hebrew Judges" in latin that compliments the betrayal to that of the real unruly Atlanteans as the Phoenicians just as they still are today at the head of our world financial systems and control, wars,terrorisms, biblical falsifications that include who God himself really is. We also know for a fact by my decoding of the 9 Greek Muses (Secret of Mylo) that not only Hesiod and Herodotus realized and preserved, but that these names in truth tell us about the control of a "Secret Society" since at least 800.bC and common with that of the Phoenician expansions of slaughter and "thou shalt be put to death" for our bloodthirsty god of lies! This does not mean, that Atlantis did not originate in the Atlantic Ocean as specified and rather obvious for the truth of our First Garden, ie; Atlanteans being "Foremost Earthland People of God's Island", but that as the Narmer Palette testifies to, Egypt became Atlantis all over again as is written upon her grounds and histories. Right after Menes we also find "Twin Kings" of Djer and Djet. DJ meaning of JA who was known as Min, Amen, Amon or Amun and also as I AM and JA of the bible before his disguise. Thus the Egyptians who were the first to say AMEN and where scholars tell you it means "the hidden one", ie our Real God! Jesus also called His Father, AMEN. Coincidently, Amen is also termed for Amenti or Foremost of the westerner which is the realm of Nun or Neptune, that is...Atlantis as the Am-Duat specificaly points to or Homer's Scheria (Skeria > Seker) or the fact that Homer tells us Atlas's island was in the Atlantic where Calypso resided. Thus, the first 10 kings of Atlantis preserved are those of Menes and the first dynasty, in memory and honor of the real Atlantean twin kings as the Narmer Palette clearly shows! Further evidence of this is the fact of the Atlantean control and that the war would have been fought in the eastern Mediterranean. When Atlantis sank in the Ocean before the straites, it even destroyed all those within the Mediterranean and the reamaining Greek warriors as written. 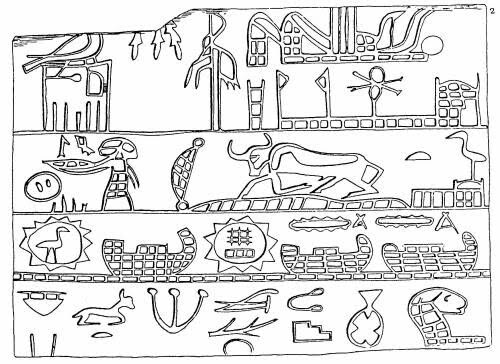 Hence, the Hathor bull symbolized with the 10 kings on the Narmer Palette. Further evidence we find in the sunken cities off the coast of Alexandria by Frank Goddo and his team or even landbridges like the Tunisian disappearing or the Gulf of Gabes becoming larger from sunken lands. The Cyclades islands and Greece itself changed with more flooded areas. The vitality of all this must lie in the Foremost Atlantean district of Maerea in likeness of JA MN who would have also been the same God for Atlantis. I have already shown much evidence that supports Menes along with the Egyptian name of Atlantis and his labels that speak of a mysterious voyage to Hat.ta.Tjeru or Hat.ta.Nt.Tjeru or God's island. There is also a Neptune Trident on the Menes lables, the temple of Neith and a Bull along with Ships. You can see my research of how the first dynasty kings relate to the 10 twin kings that were preserved around the world, even to that of Deucalion - Deka Leon as 10 lion kings or the 10 lion kings on the Atlantean Etruscan Scepter or even with the biblical kings. Even the Sumerians and Babylonians had 10 kings in likeness of our Atlantean kings, and in all probability, Menes was in fact Oannes. 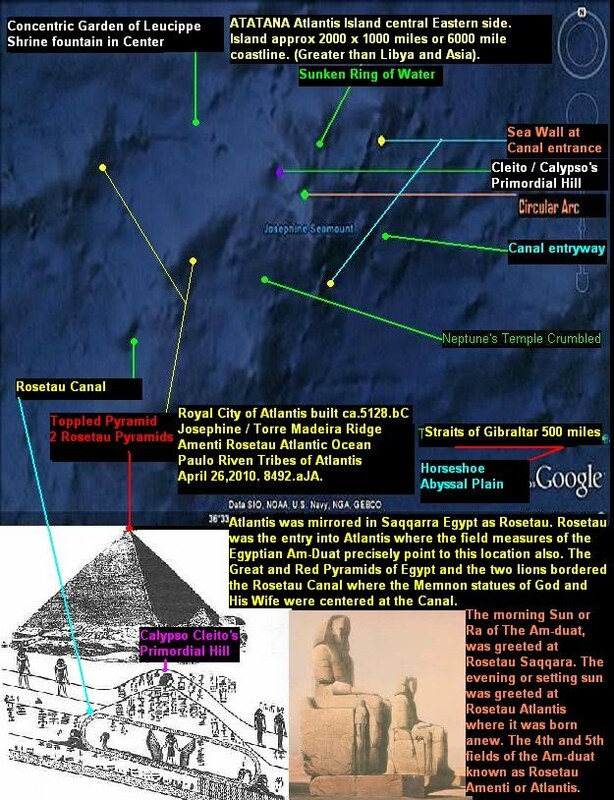 However the real answer to Atlantis lies in Neptune or Nun or Seker's Realm or Evanor and Leucippe. Study my PLATO CODE of the founders and 10 kings backwards and hidden in Latin where you'll see as I that Mneseus and Evaemon or Menes and Neith, are the main identities hidden by the simplicity of the complexity. The Marsians (tall male Germanic Scythians) and Dacians (lower Danube) , went to where the high altar's fire is lit by the Boeotian women, the muses of Aonia near mount Helicon and the spring of Aganippe, the resort of the muses by the river Cephisus in Boeotia to compose by candlelight in the evening. - Paulo J.Tx.Mn (Riven) 2007.aD. (8489.aJA). As I Am Olla Para Nosa Illa que e de > As I Am Look To The Island I Gave You = Atlantis. After All I Am an Atlantean MneSeuS and Son of JA MN. We are All Atlantean. Foremost Earthland People of God's Island! These are the Atlantean Kings and the Egyptians in order as recorded. These are the Atlantean kings revised with the Egyptian in order. Notice that Mneseus now pairs with Evaemon just like Plato's code? Djer and Djet were twins. Autochthon pairs with Ampheres like Greece and Italy as Atlantean cousins. Mestor like Mesraim is the merger of Egypt with Phoenicia, thus NNE. This may very well be the correct order for the Atlantean kings if Egypt's order doesn't change. remember by Socrates' theme of an ideal state. That night he went home and pondered over it with his friends for the next day as he wrote. *Since Djer and Djet are twins, that would have to mean that Atlas pairs with Evaemon. As in Menes and MerNeith. The beloved is Maerea, their home or "MR" to love! (Neith of MAEREA who Menes married to rule the Twin lands!). Gadeiros and Mneseus would make sense with Europe and the Minoan/Egyptians. However I feel the answer lies in as I stated that Mneseus and Evaemon are the main kings, while Atlas would become Djet ahead of Djer. (they're twins). Djet would have been named Atlas in memory of his Father Menes, which is why they relate and interchange as Mneseus for Atlas!. (Iti/athoti). Complicated but I believe the Atlantean pudding is quite tasty! Notice the use of H-otep with Sekhemwy as Mestor? This ties in Phoenicia with Pharaohs as the unruly Atlanteans who were the betrayers and cause for the war! What I suspect is that Diaprepes should be last and paired with Azaes, because of the biblical flood patriarches and Africa as the second Garden. Ie; Diaprepes as Noah,Utnaphishtim, Xisuthrus, Ubaratutu or Chrysaor, thus the last king of the list. Mestor would also compliment Elasippus as for the Phoenicians and horseriders of Asia or Mesraim for Egypt. MneSeuS compliments Min and Amen or the biblical I AM or Ia/Ya as JA MN and God's First and Foremost Garden of Creation on the island of Atlantis. Atlas and Mneseus interchange, where Atlas means Foremost of the People or Foremost Island of God's People for Atlantis. Atlas and Gadeiros are twins like Djet and Djer or the myths of Atlas and Hercules who are twins. That means the origin of the Royal City of Atlantis was at this time of 17,440.bC for the literal sense of Herodotus' 17,000 years. In accordance with my Generation theory and the 2.79 factor difference between Herodotus and our modern Egyptian record, 17,000 years would be 6093.2 years. 6093.2 plus 440.bC = 6533.2.bC. Compare that with my 6482.bC date for our Re-Creation and First Flood. This date of 6482 was also only 8.7 years away from the bibilical chapters as days of years. (cf; my Garden of Avila page > Bible Chronology in my website) It also compliments the 6000.bC view of theosophists. 8000 Egyptian years = 2867.4 + 570 = 3437.4.bC for Egypt's founding. 9000 Greek years = 3226 + 570 = 3796.bC for Greeks founding. What I feel to be true, just as the twins, two lands of Egypt or the Biennial cattle counts recorded for kings reigns, is that the numbers are all divisible by 2 or 1/2. 17,000 years for Hercules/Atlas = 8500 + 440 = 8940.bC for Atlantis, or similiar to the 9000 years mentioned by Plato. 9,000 years = 4500 + 570 = 5070.bC for the Greek state. Double Falcon Atlantean era - 4570-3270.bC. The Atlantean War and our Second Flood we remembered as the Biblical flood or Atlantis sinking is closer to the end of this era. Ie; The Hathor Flood of Horus. Spirence note; these disasters are caused by the satanic ritual of murdering the Son of Man or exchanging The Christ (Golden Orus) for satan (Black Horus). Whereas, Jasa or Philitis The Shepherd as He was known, was murdered Dec.10th at 8:08am, 3474.bC in exchange for Black Horus' birthday or an evil energy upon our Earth that allowed it dominion and caused our disasters, not God JA MN. So 150 years later, and after the plagues for their repentence to no avail upon Khufu the wicked and the times of the exodus, the world was destroyed and the Eye of Ra as Hathor sent out to destroy. We can then deduce that the flood was 3324.bC and 3284.bC life revived after 40 years and nights of flooding. The Narmer Palette with the Hathor flood and 10 kings memory is dated right around this time ca.3250.bC. However, there is a Catch 22 because of the 3474.bC date where we realize that Khufu was 885 years older than the records tell you! Not only from erroneous and hidden chronologies or errors in carbon dating, but also due to the conversions from lunar to solar calendar to hide his father Snoferu's sin and worship of Ra (ptaH) > satan > Eye of Ra > Pyramid Eye of Secret Societies today > lucifer/satan worship. So the real date of the flood would be around 4209.bC and Menes would have been around 4035.bC from 3150.bC. Herodotus stated there were 11,340 years for Egypt's history from his time and 342 wooden statues of priests (not 345 or 341 kings) were counted in his presence. Therefore 11,340 years is actualy 5,670 years (1/2), plus 440 = 6110.bC for Egypt's founding or some 655 years away from 5455. Perhaps 655 years of Gods and Demi-gods before Kings? Manetho quotes 9000 years for ptaH who became Ra. Ptah was actualy Min in disguise by them, like yahweh was a hebrew disguise for Ja Mn who is also Min. Manetho was ca.300.bC. 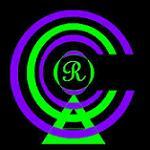 Ra is generaly the same time as the sun temples or ca.2700.bC, plus the 9000 makes Min ca.11,700.bC. PtaH they say was enstated by Menes, but this of course is not true because Menes belonged to Neith, the Egyptian province of Maerea and Atlantis. 4500 plus 2700 = 7200.bC plus the 885 missing years = 8085.bC for Min according to Manetho. However we know that Min who is Ja Mn or Amen, originated with Atlantis ca.9825.bC or literaly the 9570.bC as stated by Plato. Whew! Okay, now that we know who the Atlantean kings were in accordance with Menes as a "PRESERVANCE" of the Original 10 Atlantean kings tradition just as Plato PRESERVED the TRUTH about Atlantis and as MAEREA testifies to, the enigma is trying to figure out the Narmer Palette. The confusion is whether or not Narmer was also Menes, which appears to be factual because of his daughter TeJati in front of him on the palette and the Narmer fish symbol that associates his love of sailing and fishing or the Oannes who appeared to the Sumerians. Menes' tomb also contained a ship burial with it and his labels clearly testify to his love of ships and sailing to the mysterious island of Atlantis known as Hat.ta.Ntr.iw and a trident symbol for the Atlantic Ocean realm of Nun or Neptune. The Tatenen primordial mound of creation westward to the Egyptians or Amenti as in meaning west or to Seker's realm of the Am-Duat in the Atlantic. Therefore, the palette symbolizes the disastrous end of the last 10 Atlantean Twin Lion Kings or Double Falcons, as indicated by the twin lions being harnessed on the palette and the circle they form in the middle for the concentric city of Atlantis. Stonehenge,England and Akraim, Russia may also be symbolic dedications to Atlantis and it's customs for circular cities or constructions. The bull destroying the fortressed city below that appears to be recognized as the 3rd Nome, may also be that of Maerea or one of it's districts like Kom el Hisn or Mennefer (Memphis - enduring beauty) for the walled city. The palette must be dated to Menes being 3150-3250.bC or the prior date as mentioned 4035.bC or 4135.bC and testimony of the flood being ca.4209.bC or somewhere prior to and near Menes. Therefore, the conclusion is that the histories of Atlantis as told by Critias from Solon, were based on actual historical events of the first dynasty Egypt and the flood just prior, while the founding of Atlantis and the original kings are much older, and their names forgotten but their actions preserved as Critias said. Which is why the names changed to that of Menes and Neith who preserved the traditions of Atlantis that carried on through the first dynasty, only to be betrayed by Mestor and Elasippus, thus the account of Menes' mysterious death or that of Osiris being murdered by Seth and found under the cedar tree in Phoenicia for his betrayal, that is Osiris the betrayer of Phoenicia...see? Just like Dionysios betrayed the west with the east or the Ramesses kings. Thus Egypt's downfall and true histories were eminent, and the truth of Atlantis revealed by UadJAhor-Resne and the Atlantean Libyan king Amassis II ca.570-564.bC. That's what I believe, you don't have to! Evermore! To Know Is Immortal! reveal in truth of KA KA! That's why there is an apostrophe between QA'A for Ka or KhA. In other words repeat the Q or K as seen by his hieroglyph. Mereneit had to rule as Queen until Den was old enough. While GaDjer and Djer (Djer and Djet) are in reality before Menes and Den comes after Menes! before JAO (Atlas) and after Menes (Mnamen/Mneseus)!!! Semsem as Diaprepes. Den or Elasippus may have been Sargon or Nimrod of Babylon? Mestor would have to be the same Thoth character of Phoenicia and Egypt. years; from the building of the temple to the captivity of Israel 1,212 years.From the captivity to king Alexander 877 years; from Alexander to Jasa The Christ our God's Son, 330 years. Altogether,6482 years from our First Flood to Jasa The Christ. aulo Riven ^A^. July 26.2010.